From his law office in Georgetown, Kentucky, Richard M. Rawdon, Jr., serves the residents of Scott, Bourbon, Harrison and Woodford counties and the rest of Central Kentucky with their most important and serious legal issues by offering exceptional legal representation and advocacy in the areas of personal injury, family law, criminal defense, bankruptcy and general civil litigation. Having practiced law for more than 49 years, Mr. Rawdon possesses the extensive knowledge and skills necessary to handle even the most complex and challenging cases efficiently and effectively, and his law firm receives many positive reviews and referrals from satisfied clients. 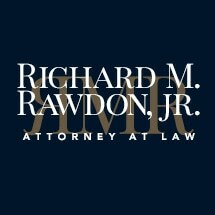 Operating with the utmost honesty, integrity and ethics, Mr. Rawdon is truly an attorney you can trust during your time of need, and he will aggressively fight to help you obtain the most favorable outcome possible while treating you and your family with the respect and dignity you deserve. Along with his extensive legal experience, Mr. Rawdon sets himself apart from other attorneys through his strong people skills, his personal commitment to his mental and physical fitness, and his unwavering dedication to his practice. To begin receiving the highest level of personalized assistance and support for your legal issues, you can contact Richard M. Rawdon, Jr., at his Georgetown law office to schedule an appointment for a free initial consultation. I reached out to Mr. Rawdon with a traffic question. Mr. Rawdon provided me a clear and concise answer and did not expect anything in return. I would wholeheartedly recommend this diligent attorney without reservation. Mr. Rawdon answered my questions and then some. Thank you for you sage advice Mr. Rawdon! Richard M. Rawdon, Jr. has been helping Kentucky families find feasible solutions to financial problems since 1968. Regardless of what kind of domestic legal problem you are confronting, you should speak to a dedicated Kentucky family law attorney about your situation as soon as possible. Since 1968, Richard M. Rawdon, Jr. has been helping victims and their families pursue financial justice through negotiation and litigation. If you have been charged with a felony or misdemeanor, you should contact a seasoned criminal defense attorney as soon as possible in order to protect your rights and your liberty.